What are clusters of galaxies ? Clusters of galaxies are the most largest bound systems in the universe . They are composed of thousands galaxies inside a radius of 1 - 3 Mpc (if H_o = 50 km/s/Mpc). Some clusters contain only few hundreds they are called "poor" galaxy clusters and even less in this case they are called groups of galaxies. The stars in these galaxies constitue a negligible part of the total luminous matter i.e stars and gas that shine of their own. Most of this luminous matter is in the form of hot gas located in the intergalactic medium (called Intra-cluster medium). The gas, which has a temperature of 10-100 million degrees, radiates in X-rays wavelength. Several space missions have been devoted to X-Rays observations. 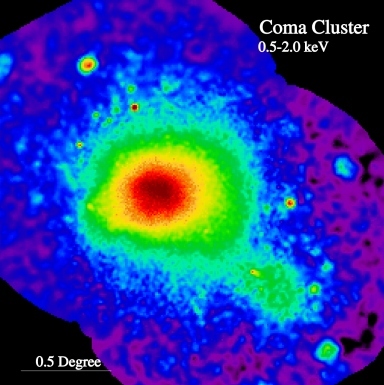 The image on the right shows Coma cluster image obtained with the ROSAT satellite. Clusters of galaxies can be detected up to very high redshift. One of such distant clusters RXJ1120.1+4318 has recently been observed with XMM up to more than half its virial radius. Such observations provides us with important information on how galaxy clusters form and evolve and their number is a key ingredient for the cosmological parameter determination. Using X-ray observations, we can measure the masses of both the hot gas and dark matter. The image on the right shows that the gravity exerted on this group of galaxies observed with ROSAT exceeds all the individual component galaxies combined. The nature and the mass of this dark component is one of the biggest mysteries in cosmology. There are mainly two schools, a baryonic dark matter and a non-baryonic dark matter school. The baryonic schools claims, that the "dark matter" is only ordinary mater (protons, neutrons and electrons and atoms that we cannot detect through visible radiation) which is actually missed from our census of the matter content of the Universe, this could be either MACHOs (MAssive Compact Halo Objects), white, red or brown dwarfs, planets, black holes, neutron stars, gas, and dust.These MACHOs are potentially detectable by gravitational lensing experiments, see this site on the EROS experiment which objective is to search for the "MACHOs" in our Galaxy. Many have been discovered through gravitational micro-lensing but not enough to account for "dark matter"
One of the outstanding problems in modern cosmology is to weight the universe, that is to measure its total matter (dark + luminous matter) content. Why is this important ? It is important because it determines the ultimate fate of the universe. Will the universe continue to expand for ever or will it collapse back in a Big Crunch under its proper gravity? If the Universe has not enough matter, it will continue to expand but if it contains enough matter then it will ultimately halt its expansion and collapse in a Big Crunch under its proper gravtiational attraction. The parameter that is used to measure the mass of the Universe is called the cosmic density parameter omega W. W is expressed as the ratio of the observed mean mass density rho to that of the critical density, the boundary density between the case where the universe has enough mass to be closed and too little mass to expand for ever, rho_c. The current critical density is approximately 1.06� 10-29 g/cm3. This amounts to six hydrogen atoms per cubic meter on average overall. If W >1 the universe is "closed"
If W < 1 the universe is "open"
If W = 1 The universe is "flat"
Clusters of galaxies provide good tools for determining the cosmological parameter W and there two most important tests to W, both rely on X-Rays observations: the baryonic mass fraction and the number counts of galaxy clusters. If clusters provide a ``fair sample'' of the universe, then the fraction of their mass in baryons should equal the universal baryon fraction, known as OmegaB (WB) which can be predicted by primordial nucleosynthesis theory. 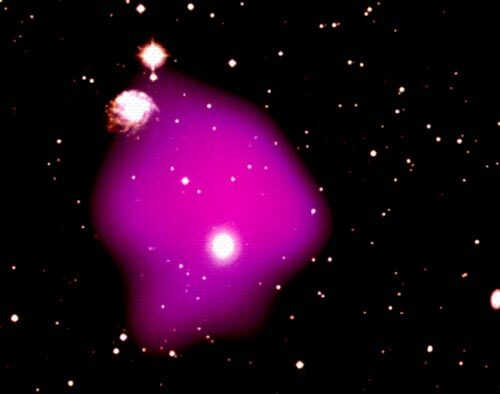 In galaxy clusters there are two main reservoirs of baryons, stars, stellar remnants and cool gas which contribute very little (about 6% of the total mass) and the hot x-ray gas which is the main contributor to baryons in clusters. The brayon fraction in clusters can be estimated from x-rays observations by measuring the ratio of the hot x-ray emitting gas to the total binding mass fb = Mb/Mtot where Mb = Mgas+Mstellar. The mass of gas in a cluster can also be estimated from the scattering of Cosmic Microwave Background photons in the Sunyaev-Zel'dovich (SZ) effect. Combining the baryon fraction in galaxy clusters with WB, one may determine the matter density of the Universe WM= WB/fb. The exact value of such quantity is much discussed as current measurements yield to values of 10-30% indicating that the matter density WM is less than one (WM < 1). What does RXTE do? This site introduces the concepts of X-ray astronomy, provides data and lesson plans, includes descriptions of discoveries RXTE has made, images and movies, and has a model of RXTE that can be printed and put together. How does XMM-Newton work, and what does it do? Starting from the basics, this site explains the instruments and the scientific goals of XMM-Newton. This learning center also contains educational resources for teachers. What is Astro-E2, what science will it do? Contains lesson plans, images, and a student competition.